The EU has an extensive cooperation with China, both at political and technical level. The basic structure and key documents for overall cooperation can be found on the External Action Service webpage - EEAS . On the same day there was also a roundtable Discussion on Environmental Governance and Green Transformation. It included officials from China's Ministry of Environmental Protection and the China Council Secretariat, and EU officials, including Mr. Jyrki Katainen, Vice-President for Jobs, Growth, Investment and Competitiveness. At the roundtable EU officials and EU Member State experts presented their experiences on environmental governance systems in EU countries, pollution prevention and control in the Rhine River Basin and industrial transformation of the Ruhr Industrial District, including green infrastructure approaches. 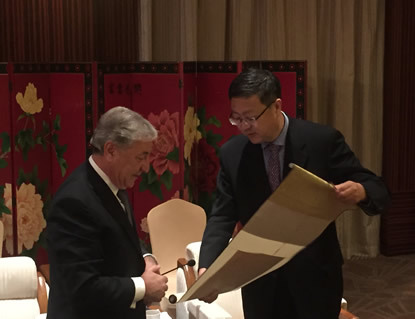 Commissioner Vella visited China in October 2015 for a series of high level meetings with Ministries holding responsibility for environmental policy: the Ministry of Environment Protection (MEP), the State Forestry Authority (SFA) and the Ministry of Water Resources (MWR). The Commissioner offered to engage with his Chinese counterparts in bilateral and multilateral work to tackle global environmental challenges and work closely on the implementation of Sustainable Development Goals and the 2030 Agenda for Sustainable Development. Environment Policy Dialogue (EPD), held at ministerial level (since 2003): the EPD meets regularly, alternating between Brussels and China. The last meeting took place in Beijing on 19 July 2013. For further information, see the minutes of the meeting. Bilateral Cooperation Mechanism on Forests (BCM), with the Chinese State Forestry Administration, SFA, director level (since 2009). DG CLIMATE ACTION also has an ongoing dialogue with China, the Climate Change Partnership. Annual Summits: EEAS in the lead. The last EU-China Summit took place in June 2015. 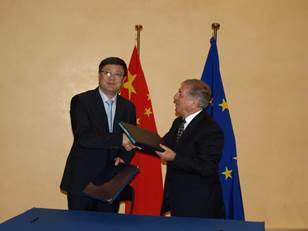 The EU-China Environmental Governance Programme (EGP) (2011-2015) in partnership with the Chinese Ministry of Environmental Protection aims to contribute to the strengthening of environmental governance in China through enhanced administration, public access to information, public participation, access to justice and corporate responsibility in the environmental field. Further information on this project. The EU-China Environmental Sustainability Programme (ESP) was launched in September 2012. The project aims to support China’s efforts to meet the environmental and climate change targets defined in the 12th Five Year Development Plan. The specific objectives focus on the achievement of environmental sustainability through improved water quality and the prevention and control of heavy metal pollution and implementation of sustainable solid waste management. Further details of this project as well as the call for proposals can be found here. The China-Europe Water Platform (CEWP). Established in 2012, the platform aims to achieve an integrated approach to water management in China. The CEWP is a political initiative and a partnership for promoting policy dialogue on water sector reforms, encouraging capacity-building, technical and business cooperation. It has a flexible structure and is seeing and increasing number of EU Member States wishing to participate in its activities. Further information. HED: EU-China High Level Economic and Trade Dialogue Mechanism is a high level meeting for discussing economic, trade and related matters.